Thanks to an explosion in the sheer variety of cool home gadgets in the past few years, some households find themselves suffering from a nasty case of Too Many Remotes. They sit awkwardly side by side on the TV stand, because it’s hardly worth putting them away when it takes the combined effort of at least two just to get to iPlayer, or lie scattered around the house. Either way, it’s enough to send minimalists mad. That’s where the best universal remotes can come in really handy. How much you should look to spend on a universal remote will be largely dictated by what you’d like it to be able to do. There’s a clear divide in our list between the high and low ends of the market, with the more expensive remotes coming courtesy of big players Logitech, and the more budget-friendly from Doro and One for All, and a bit of a jump in capabilities between the two. High-end remotes will typically have the ability to perform more complex series of commands from a single button press and control a wider range of devices, while budget remotes tend to require a bit more elbow grease to set up and use, but are usually enough for those with smaller setups. For each product below, we’ve listed the number of devices it can control, with these most often including TVs, set-top boxes, audio devices and video games consoles. Many universal remotes can’t control newer generations of PlayStation or smart home gadgets because they use either Bluetooth or Wi-Fi rather than Infrared signal, but the solution is easily found by going for a universal remote with its own home control hub, such as the Logitech Harmony Companion, below. 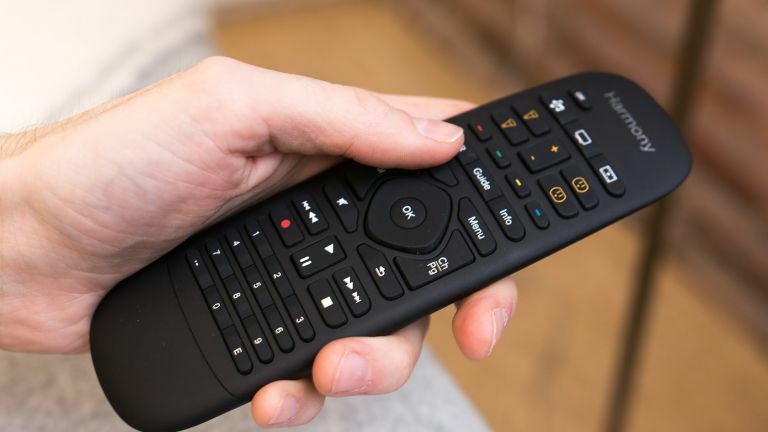 If you’re sick of having to switch remotes twice and say five Hail Marys every time you want to switch on the Xbox, or skipping past endless shopping channels to find an episode of Grand Designs you haven’t seen before, this Logitech remote may just be the answer. Its bright LCD screen lets you reorder up to 50 channels to keep your favourites close by and easily swipe to entertainment like games and movies, and can control up to 15 infrared devices. Its smart design give is a look akin to a high-tech house phone, and the screen and backlit keys illuminate when it’s picked up and moved, which is a nice touch. The Companion might come from the same range as Logitech’s Ultimate Remote, but its features are all its own. For one thing, it’s missing the LCD screen, but that’s not necessarily a bad thing, and it makes up for it in functionality. This one is designed as the perfect addition to a smart home, not only able to control TV, games consoles, and media players, but smart home accessories like smart lights, smart thermostats, and even Alexa-powered speakers. Remote gone walkabout? You can even use the Harmony app and included IR blaster to turn your tablet or phone into a universal remote in its stead. Yep, you guessed it, it’s another Logitech – but this is the last one, we promise! The maze of small buttons on this universal remote control might be a little daunting at first, but it’s quite a sensible interface when you get down to it. Designed to replace eight different remotes, the buttons are grouped by function, so you have one section for typing channel numbers, one for playback, and so on, plus handy backlights to help you navigate with the utmost ease on those moodlit evenings. When universal remotes are intended to make life easier, the abundance of buttons on the 650 Infrared might look counterintuitively tricky to the non-tech-minded. If you want to take it back to the very basics, this budget universal remote control from Doro might be just the ticket, with only seven programmable keys to worry about. Interestingly, this is a learning universal remote, meaning it takes cues from your existing remotes and remembers them, so you don’t have to individually enter in any command codes. Other than that, it’s very much on the basic side, but for around £20, it does a bang-up job. Whip your TV, box, DVD player and audio devices into streamlined shape with this incredibly budget-friendly universal remote. While that makes a total of four devices, half that of most of our other picks, if you don’t live in a particularly tech-heavy household but still tire of chopping and changing TV remotes, it’s perfectly ample, especially for under £20. Like the Doro remote, it learns from your existing onner-offer, meaning you don’t have to spend ages manually programming it, and One for All claim you can set it up with three simple steps in under a minute, so it’s also a good option for the time-starved. While strictly speaking not a universal remote per se, Touchsquid is an incredibly popular option for those looking to streamline their home setup. It’s actually a universal remote app that turns your smartphone or tablet into a zapper, assuming your device has its own IR blaster, or can be paired with something that does, and comes in two forms: the Home version, which allows control of up to six devices per room profile, and the more expensive Pro version, which allows up to 14. Reviewers found it simple to programme, just as simple to use, and quick to load, however if you like the real feel of buttons and haptic feedback, you might prefer something with a more physical presence.